The United States resumed direct diplomatic ties with Libya on Monday after a 24-year break, even as the Bush administration pursued reports that Moammar Gadhafi had taken part in a plot to assassinate Saudi Arabia's crown prince. The announcement was made in Tripoli by Assistant Secretary of State William J. Burns, after talks with Gadhafi, and also at the State Department. Burns inaugurated a new U.S. liaison office in Tripoli in what was the latest move by the Bush administration to reciprocate for Gadhafi's promise last December to dismantle his chemical, biological and nuclear weapons programs. Earlier Monday, two senior Bush administration officials held an unannounced meeting with Libyan leader Moammar Gadhafi to discuss bilateral relations and reports that Gadhafi plotted to assassinate Saudi Arabia's ruler. "I think we made clear our concerns about the story, as well as reminding Libya of its assurances not to use violence for political objectives," State Department spokesman Adam Ereli said about the meeting in Tripoli. Ereli added that if the reports prove true, "it would call into question continued development of relations with Libya." Libya has long been on the State Department's list of terror-exporting countries. Relations with Libya took a sudden lurch forward after Gadhafi started shipping parts of his weapons program to the United States. 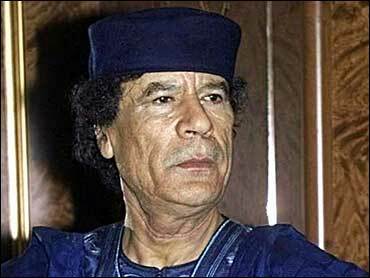 The Bush administration promoted Gadhafi's move as evidence of a success for U.S. foreign policy. Bush acted in April to restore normal trade and investment ties with Libya, including the import of Libyan oil. But Libya was not removed from seven countries on the State Department's terrorism list. The American officials who met with Gadhafi were Assistant Secretary of State William J. Burns, who is in charge of Middle East policy, and J. Cofer Black, head of the department's office that deals with policy against terrorism. President George W. Bush, speaking with reporters this month after the G-8 summit in Georgia, confirmed that U.S. investigators were looking into reports of a plot against Saudi Crown Prince Abdullah to try to establish its veracity. Abdullah is Saudi Arabia's de facto ruler in the absence of King Fahd, who is gravely ill.
"When we find out the facts, we will deal with them accordingly," Bush said at the time. "I have sent a message to him (Gadhafi) that if he honors his commitments to resist terror and to fully disclose and disarm his weapons programs, we will begin a process of normalization, which we have done. We will make sure he honors his commitment." State Department spokesman Richard Boucher said Libya had given repeated assurances not to use violence to settle political disputes after the United States received reports last year of Libyan contacts with Saudi dissidents threatening the Saudi royal family. The alleged plot against Abdullah was revealed separately by Abduraham Alamoudi, an American Muslim leader jailed in Alexandria, Virginia, on federal charges of having illegal financial dealings with Libya; and by Col. Mohamed Ismael, a Libyan intelligence officer currently in Saudi custody.